I faced a demon today. She did not get the best of me either. Sometimes you have to stand your ground when someone is trying to bully you, intimidate you, and push you around. Whether it’s work, friends, family, or someone on the street. Don’t let ANYONE treat you like you’re unimportant, not valued, or worthless. Go to God’s Word and read what wonderful things He has to say about you instead. You are beautifully and wonderfully made. You are His child, and He loves you. That’s where your self worth needs to come from … God. Stand firm and God will strengthen you for whatever battle you’re facing. God will help you slay the demon in your life as well. My strength comes from THE LORD! Yes, you can still be a Christian while refusing to be someone’s door mat and beating post. What a lot of people refuse to see is that people will go above and beyond when they are shown that they are valued and appreciated. BUT when you’ve taken abuse long enough, God will help you fight your battle just like He did with David and Goliath! You don’t have to sit there and continue to take it when someone is mistreating you! You have EVERY RIGHT to stand up for yourself!! It’s a New Year, and I’m going forward with my head held high walking with God. Here and now, I proclaim that GOD is for me, so who could possibly be against me? Sure, as Christians we will face trials and troubles. We will be tried, pushed to what seems beyond our limits at times, but God has not forsaken us. Instead, He is equipping us with the weapons we need to fight this war. You see, I thought I could give someone the benefit of the doubt. I thought I could push aside all of my past experience with this individual and see the GOOD in her. However, some will say that I placed myself in this position. I knew what she was like in years past, but due to her cancer diagnosis and going through treatment, I thought she was different. It appeared she had a change of heart and was nicer, sweeter, kinder. AND YET, now that she’s in remission, here I am two years after returning to work with her when she called me asking for help … and now she has turned against me, said awful lies about me and has twisted the story around to suit her to where SHE is the victim and I’m the one supposedly doing all of this to her. Ah, but people that know her truly know what she is like. Her own cousin called me years ago to WARN me against involving myself with this person. I found it odd at first when her own family member called me out of the blue. I had only met her cousin twice, and yet she’s on the phone warning me not to get close to this individual. Then she tells me that there is a reason the individual is all alone; due to how she treats people! It has taken me two times now — with 10 years in between the first time she did this to me and my current situation — but I have finally come to understand what her cousin was saying all of those years ago. She is alone because she uses people and then turns on them. She used me for two years this time. I felt sorry for her! I would go to her house to spend time with her because I felt sorry for her living alone with just her dog and not having any friends or family that would come see her. So, I went to see her and spent time with her – at work and outside of work. And the thanks I get is what unfolded in December and again earlier today as well. This is me proclaiming that I am DONE with this person. I stood up to her today, and she did not like it. She thought I would be a push over like in years past, but she was wrong. I gave her a taste of her own medicine, and it was awfully hard for her to swallow it. Ten years ago, she chased me around the office harassing me. I cowered under the pressure and her abuse, and I left. I only went back when she asked me two years ago for help. I considered it, remembered the abuse from the past, prayed about it, and then went forward due to my kind, tender heart wanting to give her the benefit of the doubt and see good in her. Where did it get me? In December, I was the one shaking mad and in tears in when she launched her attack on me. This time, SHE was the one reduced to tears when she saw that no matter what tactic she tried to use, I was NOT backing down or cowering in the corner at her attempts to bully me. Because she had an audience today, she was bolder, braver, and thought for sure she was going to win. I may have left the company but not before they saw her true side come out in front of them as well. Will they do anything about it? Probably not. That is why bullies are so bad! They are allowed to get away with it. But, she won’t get away with it any more with ME being her beating post or ME being the one she tries to intimidate and push around. The thing is that GOD has blessed me with an incredible financial position where I do not HAVE to work. I WANT to. That is the big difference. My husband has a wonderful job with people that values him and SHOWS it. They compensate him nicely, and I am THANKFUL for God’s blessing in that area of our lives. I’m thankful for ALL of God’s blessings! But my point is that I did not HAVE to work. I WANTED to just so I could occupy my time while my children were in school. Well, I am sure I can find other things to occupy my time instead of going into an office daily to endure harassment, bullying, and where punishment is served to the ones trying so hard to work and do a good job. Here and now, I remove myself from this situation. I had already removed myself December 17th, if you want to know the truth. I only went back today to face the demon. She requested a meeting. I knew what the meeting was going to consist of; her raking me over the coals with an audience. I was not wrong either for that was the exact thing that unfolded this morning. However, had I not gone in to face the demon, she would have thought that she won. So, I showed up, and God was right there by my side the entire time providing strength. Why do I refer to her as a demon? I am not being ugly about it. I had someone tell me in December that the person I described, with everything she was attempting to do to me, say about me, and put me through, was a demon. The one I was speaking to was not involved in the situation at all, so he could give a fair observation and unbiased opinion. Believe me, if I had been wrong, this person would have no problem telling me, and I respect their opinion so I would take a second look at myself if they did say it was me. But, within a few seconds of telling a small portion of what I had endured, this person said that I was dealing with a demon; she sounded and acted possessed. It was then that I realized I could possibly be dealing with a demonic force. I know that Satan comes to steal, kill, and destroy. He comes at you with his sly, sneaky ways befriending you, trying to get in good with you, finding out your weaknesses so he can come back and use them against you. Just when you think you’re safe, he ambushes you. He throws all of these accusations in your face; HE IS THE ACCUSER OF THE BROTHERN. He will use his forked tongue to spew lies and untruths. He will try to get you where it hurts and take you DOWN. BUT … MY GOD IS GREATER!!!!! MY GOD has defeated the devil before, and HE defeated the demon in this person TODAY! The devil tries so hard, but he needs to go back to HELL where he came from as he is NOT welcome here. IN THE NAME OF JESUS, I REBUKE THE DEVIL, HIS TACTICS, AND THE HOLD HE HAS TRIED TO TAKE WITH ME AND MY FAMILY. I CAST HIM OUT AND BACK INTO THE PITS OF HELL! MY GOD IS IN CHARGE, AND MY GOD HAS HIS ARMS TIGHTLY AROUND MY ENTIRE FAMILY KEEPING US SAFE SO NO HARM CAN COME TO US! IF you are struggling in your life with your own demon possessed person, take God’s hand and your bible. Equip yourself with the WORD OF GOD, and start fighting in PRAYER! Then RISE UP … and walk with authority as GOD has already defeated the devil, and you are a child of GOD! Rise UP and go forth. God will help you fight your battle and slay the demons trying to take you down. 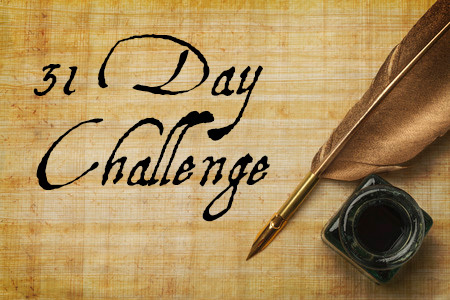 After this post was written, I realized it would go with the prompt word “Here” on Tuesday At Ten, so I am linking up! You should, too! The year was 1989, and I had just graduated from high school in May of that year. A few short months later when I was trying to stretch my wings out in this great big world, fear struck as a hurricane was headed our way. I’ll never forget boarding up the windows of our home and securing items outside as much as possible as we awaited the storm that was approaching. While it would hit landfall on the Isle of Palms near Charleston, South Carolina, an hour and a half away from my small hometown, it was such a massive storm that the effects would definitely be felt in my area. We lost power sometime in the night when my eyelids finally decided to close and allow sleep to come. We awoke to downed trees, but thankfully our house did not sustain any real destruction or damage. We were part of the lucky ones. Yard cleanup was all that was required, and shortly after daybreak, we began this task in our front yard. I’ll never forget wearing a knit sweater the color of the sun with a pair of Bermuda shorts as I helped my family clean up fallen limbs. As I bent down to reach for another limb, a guy that expressed an interest in me during my Senior year of high school stopped by with a couple of his friends. He could not hide his amusement as he smirked at my apparel, and looking back, I’m sure I was a complete mess with my hair pulled back in a ponytail working to get the yard free of debris. I stopped only for a minute before continuing my task, and despite how I looked, I was just thankful to be there in one piece with my family on yard duty! It’s hard to believe that 26 years have passed now since Hurricane Hugo swept across the coast of Charleston causing destruction along the way. What is even harder to believe is that I have been out of school for those 26 years! In my heart of hearts, I’m still YOUNG … and yet, time just keeps marching on trying to tell me that I’m not as young as I used to be. Young at heart, though, is what I will always be! This unforgettable moment was brought to you by the prompt phrase of “A moment I will never forget …” on Karen’s Tuesday at Ten. There are people in my life that take advantage of me. They take advantage of my kindness and my forgiving heart. These same people expect chance after chance after chance … while they are repeat offenders … and yet, I try to be forgiving just as Christ is forgiving of me when I fail and fall short. The problem I have is as a Christian I’m supposed to turn the other cheek. My question then is, how many times am I supposed to turn it for it to be slapped repeatedly? Those are not easy questions to answer. You see, I’m not putting myself out there to get hurt. I’m not doing this hoping that they will hurt me. No, just the opposite. I hold out hope each time that it will be different. That there won’t be any more lies, deceit or betrayal. It is only because of the love I have in my heart for the person that allows me to hold on and hold out hope. I try to see the good in people, and even though they have mistreated me in the past or done things that were not right, I know deep down inside that they are not completely evil. They don’t have a black heart, and they aren’t rotten to the core. I know this because I have seen the side that I’ve longed to get back. The kind, considerate, loving, compassionate individual … and I have also seen that person disappear and an angry person with no conscience emerges and does things that are shameful, degrading, and shows that they lack morals, values, and integrity. While they may not stay in this frame of mind or state the entire time, they go back, almost like Dr. Jeckle and Mr. Hyde. It happens without warning. Then all of a sudden, this person is back and you’re trying to figure out what triggered it. What set it off? And how long will it last THIS time? The thing is, this person is not honest with you as to why they changed back. And, even if they were honest, they have told so many lies and have withheld information that was later discovered, that the vast majority doubts what is being said. This person’s word means nothing at this point. From when they are caught in a lie and they say, “I don’t know” or “I can’t remember” when you ask them something point blank, both are dead giveaways of yet another lie. More deceit. More betrayal. And, here is something gut wrenching. You can’t even believe when they say, “I love you.” Sure, these are nice words, yet their actions scream something to the contrary. It happens almost every time, too. They either talk down to you like you’re crazy, they make light of the situation and your feelings, OR they get defensive and anger emerges. Are they angry that they got busted once again? Are they angry that they were found out once more? Here is something they fail to realize: Nothing that is done in darkness will stay hidden. It will be revealed in God’s time. He will shine the brightest light upon it. If I have anything to offer at this point, it is to any one out there reading this that may not be who they should be … change! You CAN make a complete change. You don’t have to be that person any more. Ask Jesus to help you, and I promise you that He will. While it won’t be an over night, immediate change, He will help convict you and change your ways. Then, when you feel tempted again to act the way you did before or do the things you once did, God will be right there speaking to you letting you know that it isn’t a good idea and it doesn’t have to be this way. If you repent of your sins and confess them with your mouth, you have to TURN from them! You cannot confess and repent while still doing these things! That is not true repentance. That is not wanting to change with your whole heart. If you have done something that you know is not right, you have to fully disclose everything to the person you have hurt. You cannot give a little information here, a little there, and later on down the road confess to more. That only prolongs the hurt and the healing process. If someone has found it in their hearts to forgive you after you’ve lied, cheated, deceived them and betrayed them, and they have slowly started to heal, you throw them completely right back where they were when they first discovered your wrongdoings. You make it ten times harder for them as you’ve ripped that scab completely off of their wound, and it is oozing blood at this point. They are unable to stop the bleeding. It pours out of the wound, and the cut feels deeper now with each newly found betrayal or newly confessed indiscretion. Here’s a tidbit for you. Withholding information is also a form of deceit and betraying the one you claim to love. And … treat others the way you want to be treated. If you would not want someone to do this to YOU, then WHY are you doing it to THEM? Why is it okay if YOU do it … yet if they did something exactly like this to you, you would run from them so fast and never look back. You wouldn’t have such a forgiving heart, and you wouldn’t accept them back for doing the exact same thing that you, yourself, have done. Take for example a person that has committed adultery. IF your spouse had done this to YOU, would you be as forgiving as you expect them to be? That is a hard one, isn’t it? But, if it’s okay for YOU to do it and later be forgiven of, why is it not okay for your spouse to do the same exact thing? Why then would you NOT forgive your spouse for committing adultery if you, yourself, have done it to them! Here’s another tidbit: Cheating isn’t always just in the physical form. Even though you haven’t physically slept with someone, if you have thought about it in your mind the bible tells us that you have already committed adultery in your heart with this person. Keep that in mind. Also, if you have to delete text messages, emails, etc. so they can’t be seen, you are already there, and that is also considered cheating! Recently, I became a mirror to the person that was mistreating me. When they talked to me ugly in the past, I would try my best not to go back at them the same way. Seeing as how that did not work, recently I gave them exactly what they gave me. If they were mean to me, I was mean back. If they ranted, I ranted back. If they had a harsh tone, I had a harsh tone back. And you know what? They had the nerve to ask ME why I was doing this to THEM! I quickly pointed out that I was mirroring them and that if they did not like it, they needed to stop doing this TO ME! I was a reflection of THEM at that point. Some times that is what it takes for the offender to stop dead in their tracks! I pray for this individual. I have turned this individual over to God because I am not in control of this individual nor what they do. I am only in control of myself, what I will tolerate, and how I will choose to respond. This person is in God’s hands now. If you have someone in your life that is a repeat offender, you can’t handle this one on your own. Ask God to help you, and I promise you … HE WILL! Turn this person over to God and allow God to work in their hearts and lives. Know that you have done all that you can do, and now it is up to God. You can’t save people from themselves, their mistakes, or their poor choices. Do not make yourself miserable any more trying. They are responsible for their actions, and they must face the consequences whether they like it or not. This is my advice and words to live by. Join us for Tuesday At Ten with Karen each week to share your thoughts. You’ve been through a lot in your lifetime. Sorrow has touched your heart at times and has brought you to your knees, but you don’t stay down for long. That’s what I love about you. No matter what you are faced with, you choose not to be the victim. Instead, you are a survivor! You have encountered those that have mistreated you time and time again. Yet, another chance is given to those individuals not because you wish for more ill treatment. No, instead, you see the good in that person even when they don’t see or exhibit that good with their behavior and actions. You see past the hurt and pain they have caused, and you hold out hope that things will change for the better. You do not want to give up on people, and so you hold on. No matter what, you hold on, probably longer than you should in some cases, to hope. A hope for a brighter future, a better life, a happily ever after. It doesn’t have to only be something that happens in fairy tales, you tell yourself. You seek it out. 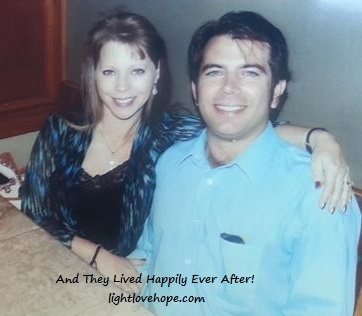 You truly want your happily ever after. The riding off into the sunset together kind of happiness. Even when life happens and a wrench is thrown into your plans, you keep on trucking. Remaining focused is the key. Not dwelling on the bump in the road or the shattered dreams, yet picking up as many pieces that you can fit into your arms, you carry them on down the road to build upon and slowly put back together. Even still, the jagged pieces aren’t tossed aside, they are loved, tended to, and nurtured, as you do for others along your path in life as well. You have flaws just like the rest of the world, but here’s the thing. Your flaws do not define you! (Your daughter would be proud that you used and built upon Damion Fizzy’s quote “Your flaws don’t define you” in this post.) They are just a part of what makes you the wonderful person that you are. Feeling flawed, battered, bruised, and tossed aside at times, you are still not those things. None of that defines who you are deep within your heart down to the very core of your being. Who are you? YOU are a child of God. You are deeply loved by Our Heavenly Father. He took great care when he developed every single thing about you that makes you uniquely yourself. God does not make mistakes so rest assured that you are exactly the way God wanted you to be. And … you are pre-approved by the only one that really matters. Your Master, Your Maker, Your Savior! Dear one, you don’t have to strive to get from man what GOD freely gives you!! You have His approval, His love, His validation, His promise that He will never leave you nor forsake you. Others may come and go, but Your Heavenly Father will NEVER leave your side. People can steal from you material possessions, but no one can EVER steal the love you have in your heart or the love that flows freely from your Heavenly Father and from your children directly to you! Those are the only things that truly matter in this life. And you’ve recognized this early on. You don’t base your worth on material things. You know that real wealth is not measured by anything you can buy. To be wealthy is to know love, true love, and have the ability to feel it, express it, and share it with others. When once anxiety would consume you, now you have realized that you are not in control of the universe and are okay with that. While we would like things to be a certain way, they won’t always be. With this knowledge, you have been able to let a lot of things go. Thus, you have relieved some of the weight of the world that you carried on your shoulders for so long. The weight that you placed there or felt was placed by others. How freeing to realize that God has the final say in how things work out, and no matter what, He sees the bigger picture when we are not able to do so presently. You have been able to do exactly what the scripture says. When you don’t know what to do, you just be still, sweet one … and know that HE is God! He will work it out. Just place it all into His very capable hands and watch Him work! You have grown, sweetheart. It has been a pleasure reflecting back on just how far you have come. 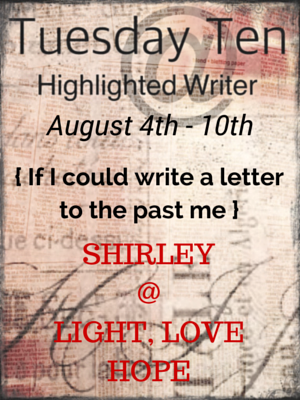 Be sure to join us each Tuesday and link up your post! I was reminded yet again of a lesson I learned the hard way. Sadly, my daughter has learned this lesson early on in her life as well. What I have learned is you can try to do everything just right and please everyone, but it is impossible. No matter how hard you try, someone is going to have a disapproving remark or look down their nose at you. There are some people that no matter how hard you try, nothing will ever be good enough for them. Sad, but true. Just recently my husband and I attempted to join a group, yet early on, I sensed that I was dealing with someone that just was not going to be happy with me no matter what I did. I realize that not everyone will like me, and that is okay, too. They are missing out if they choose to turn their noses up in the air and act as if they are better than me. They aren’t. We are made out of the same stuff, whether they want to acknowledge it or not. It just seems sad when a group of people are supposed to be coming together for a great cause only for it to end with hurt feelings and holier-than-thou attitudes. I’m me. Plain and simple. I can’t be anything but me! Like me, love me, hate me, judge me … at the end of the day, I’m still going to be myself. That is good enough for GOD – then why isn’t it good enough for judgmental people that are waiting around every corner to tell you that you’re not good enough? Oh I beg to differ. I am a child of God, and HE loves me. He died on the cross for me. I AM good enough to receive the most precious gift ever – Eternal Life. What gets me is the “church people” or fellow “Christians” that think they sit up on the judgement throne. They are full of criticism and condemnation, BUT … if they will remember, there is NO condemnation in Christ None! AND furthermore, who are they to judge me or the life I’m living? They have NO authority! ZERO! I am secure in knowing that my Heavenly Father knows my heart, and THAT … that is all that truly matters. If you feel wrongly judged, go to Jesus with your concerns. Let Him reassure you with His love. Turn to His word and see what Jesus says about you, for you are a precious Child of God! Don’t let others get you down. That’s something everyone likes to say when you’re feeling discouraged. I say that it’s okay to feel down for a moment when you’re disappointed and hurt by judgmental remarks that people make. Just don’t stay there. Don’t camp out there and decide to dwell upon what the nay-sayers spoke about you, your life, and your family. GOD knows your heart – and as long as you are straight with the Big Man Upstairs, you don’t need to explain or justify your position. You just need to be secure in who you are … a Child of God … and let the rest go. Pray for those that judge you, and hopefully one day they will remove the plank from their own eye instead of focusing on the sawdust in yours. Be blessed, people. There are so many in this world that can’t wait to tear you down. Why? To make themselves feel better. They obviously don’t feel too good about themselves so they want to latch a hold of you and bring you down right along with them. Don’t allow it. Rise above it, people. You are better than this, no matter what they say. Oh yes, I have learned that other people’s opinions of me simply do NOT matter. What God thinks of me does, so I will live my life for an audience of One and hope that He is well pleased. With trouble to the left and right of you, seemingly every where you look … I am encouraged by a friendly smile, a gentle touch, a considerate and thoughtful act. I am encouraged by those that take the time to show that they care. Of course, there are going to be long lost people that you haven’t heard from in a while, yet they resurface in your life when they KNOW you’re going through a hard time. Why do they resurface at times like this? They aren’t there to encourage you. They are only there to bring you down, or even to kick you when you’re down. In this world that we’re living in today, though, I can take heart that not everyone is this way. Oh thank you GOD that there are still genuine people in this world that just want to love, support, and be there! The world needs more of that! That … THAT encourages me more than anything … when someone will push all things aside just to let you know that they care … they love you … value you … and you are so important in their life! All it takes is a heart-felt gesture. And it changes everything! When given the opportunity to be an encouragement by spreading cheer and positive energy every where you go … do you choose this path? Do you give your best to those around you in your work day – your co-workers, the secretary, the receptionist at the front desk, the boss … or even those you encounter behind the counter or at restaurants serving you when you’re having a meal. Do they get more of your kindness and consideration than members of your own family? Wow, did I just step on some toes? Are you different around others, yet you turn into Mister or Miss Crabby Pants around your family? Realize that there are those right in your own house, under your same roof that could use encouragement. They could use loving kindness, words of affirmation, thoughtful consideration … and respect even. Plain and simple, the ones in your own home need your love. If someone had to write an article on you, what would they say? Would they say that you were an encouragement in their life? Would they say that you show compassion? Would they say that your family comes first? I am encouraged by those that wish to do better, who wish to make a lasting change, and who share the best of themselves with people — but reserve a special part of their heart, their love, their thoughtfulness, and their soul for their spouse. That should not go without being said. No one gets that part of you but your spouse! My sister’s life was cut short. She passed away at just 33 years old, two weeks after delivering her only child. Oh, I will never forget the day that my sister came to my place of employment to tell me the news that she was pregnant. She asked me to walk to her car where she immediately placed a neatly wrapped package in my hands. The wrapping paper was so pretty and delicate with a little ribbon tied around the square item that I now held in my hands. I looked at her with this big question mark over my head, I’m sure, as it was not my birthday or any special occasion so I could not understand why she was presenting me with a gift. I slowly started to unwrap the present as I glanced up at her. She was standing in front of me with the sweetest smile forming on her lips. I carefully ripped back the paper to reveal the back of a picture frame. As I turned it over and feasted my eyes upon the picture that this silver frame held, I could contain my excitement no longer. Inside the picture frame was an ultrasound picture! Without saying a word, I KNEW! After several squeals of delight and wrapping my arms around my sister’s neck to give her the biggest hug ever, I stepped back to examine my little niece or nephew that I would meet in a few months. Oh no, I will never forget the day or the way she announced her pregnancy to me! Her way of doing this was extra special. My sister allowed me to be a part of her pregnancy. She kept me informed of doctor appointments and the results of testing as well as when other ultrasounds were scheduled. I had the honor of throwing a baby shower for her, just as she had done for me four years prior when I was pregnant with my oldest daughter. We shared so much during those months of her pregnancy. Time that I treasured and wish I could have slowed down a little more to have enjoyed the last months of her life. I had no idea at that point in time that as much as we were eagerly awaiting the baby’s arrival with the days seeming to crawl by … we now wish they would have gone a little slower so we could have savored more time with her here on this earth with us. Ah, but there was no way for us to know. I was allowed to be present for my sister’s delivery. While I was not in the room, I was standing just outside of her hospital room when my niece took her first breath in to release the sweetest little cry which was music to our ears! I remember literally jumping up and down in excitement right there in the hall when I heard the beautiful sound of her baby crying. Within moments, the nurse was coming out of the room to let us know that my sister delivered a little girl. When the doctor had her ready, I was allowed to take my place by my sister’s bedside as I gushed with pride at the pink, wrinkled bundle of joy that she held in her arms. What a precious, precious sight to see. My sister … the one that once tormented me to no end in our childhood days … was now a mother! The nurses were ready to take the little bundle to the nursery to weigh her and put her cute little baby footprints on the page in the baby book that I had given my sister a month earlier. Her husband allowed me to be present in the nursery as they did all of the necessary things that are required for a newborn. There I was, smiling widely as I snapped picture after picture, standing next to my niece anxiously awaiting the moment I would be allowed to hold her for the first time. That would have to wait, though, as there was business to tend to. I remember looking through the glass of the nursery and seeing my parents and her inlaws smiling back as they ohh’ed and ahhh’ed over the pink, wrinkled skinned baby girl laying there in all of her glory. What a precious moment that I was allowed to be a part of. Later, we returned to my sister’s side with her baby all cleaned up, and then it happened. I was given the green light to hold my darling niece in my arms! Finally, I could hold this little angel and look into her sparkling brown eyes while using the lightest touch possible as I stroked my index finger across what little bit of brown hair covered her tiny head. That’s all we had with my sister after the delivery of her daughter. Our happy moments were soon a distant memory as we learned of my sister’s passing. Death came knocking that scorching hot and humid July day. I will never forget fearing something was terribly wrong and racing as fast as my Honda Civic would go own the country roads to my sister’s house that day. I could not get there fast enough. I had such an urgency in my being after not reaching her by phone all morning long. That day was the first day her husband was returning to work after the delivery of their daughter, and I knew something was wrong when she did not answer the phone despite my practically ringing it off the hook. I called the doctor’s office as she was supposed to call for an appointment that day, yet, they had not heard from her. Sharing my concerns with them, they, too, began calling her but were unable to reach her. When the nurse asked me if I thought my sister might harm herself or the baby, I practically threw the phone on the floor as I raced out of the door at my office and got behind the wheel. THAT was my biggest fear. It had now been spoken out into the universe, and I had to get to my sister … right … then! We knew that my sister was having a little trouble. She wasn’t sleeping. We knew she had concerns as to whether she was being a good mother to her newborn daughter. YES! She was such a good mother, and it showed in how she gently and tenderly cared for her daughter. She did not sleep due to standing over her daughter’s crib as she was afraid something was going to happen to her baby. Sure, we tried to relieve my sister so she could get some sleep, but we saw her shadow across the threshold behind the closed bedroom door, and we knew that sleep had not come after all. That was why she was making an appointment first thing that Monday morning when the doctor’s office opened up. And yet … the call was never placed. Back on the road, my thoughts were consuming me, and the urgency was rising up within me even more so than before. I HAD to get to her. Speeding down the road, I soon saw a gray car in my rear view mirror. This car was so close to me with flashing yellow hazard lights behind me. I just knew it was an unmarked police car. Regardless, I would not stop. NOT even for the blue light that I was anticipating at any given moment. Instead of the blue lights, though, the gray car attempted to get beside me. I stomped the gas pedal even closer to the floor as I thought they might be trying to get around me, and I was NOT stopping for THEIR emergency. I had an emergency of my own! I turned the corner and everything seemed to go in slow motion at that point. I could not believe my eyes. There was yellow caution, police tape around my sister’s house, and her house was surrounded by police cars. And then, the gray car pulled in behind me, and as I turned around, I saw my dad rushing to stand before me where he grabbed me … and I knew. Instantly, I knew … our greatest fear had become a reality. Without my dad saying a word, I knew that my sister had ended her life. As his strong arms were wrapped around me as tightly as he could hold me with the palm of his hands on the back of my head, I sobbed deeply into his chest. There were sounds that day that I could not identity as I had never heard them before – or since – and I pray I never do again. Those sounds came from me. Heart wrenching, deep from the core of my being … sobs and wails … as my heart shattered into a million pieces inside of my chest as my daddy held me up in his embrace. That was – without a doubt – the worst day of my life when I lost my sister. My only sibling. The only other person that could identify with childhood memories. I lost my best friend that day. Thirteen years have passed now, and I remember this all as if it was yesterday. When it happened, I did not know how I would make it from one minute to the next. I had no idea how I could possibly draw my next breath now that she was gone. This hurt and pain was unlike anything else I had ever felt before in my lifetime. It was as if someone snatched me up with lightning speed and threw me full force into a brick wall. I hurt, I ached, I shook. Sleep would not come for me as nightmares took its place. While I did not see my sister end her life, I had this horror movie that played on repeat in my brain that I could … not … shut … off! Post traumatic stress syndrome. We learned what that was after my sister’s passing. And as badly as I was hurting, it was magnified for my parents. My dad, I later learned, had witnessed the aftermath of my sister’s suicide. He and my brother-in-law were the ones that found her. My dad had rushed to my sister’s house after I told him I could not get her on the phone. He heard the baby crying but could not get into the house. He called her husband at work, and he rushed home to meet my dad. Together, they went into the house where they found my niece in the bassinet that I had given my sister. There my niece was laying in the white bassinet, crying. They made their way down the hallway and into the master bedroom where they found my sister. I can not begin to imagine the horror that my dad lives with to this very day after what he saw in that room. While my brother-in-law ran screaming from the room and later fainted on the kitchen floor, my dad stayed in the room crying over his daughter. Not wishing for anyone else to see my sister this way, my dad took a sheet and covered my sister’s body. Yes, thirteen years later, and we are the survivors that have had to find a new sense of normal. We had to learn how to walk around with our hearts shattered now that my sister was gone. We had to learn how to act again, and how to function with such a big part of us missing. I often wonder what it would have been like if my sister had reached out for help that day. Instead of taking matters into her own hands, I wish she would have called me and let me know that she was struggling as she had never struggled before. Oh, how I wish she had given me a little insight into the pain that she kept hidden from us all in those two weeks. Yes, we knew the lack of sleep was an issue, but we did not know the emotional turmoil that she was feeling. Until it was too late. We were only allowed to be around my niece a handful of times through these 13 years. That added to our pain as the only part of my sister we had left, we were not able to be with. We were not allowed to be an active part of her daughter’s life. We were not allowed to be there for her, to bond with her, to love her and show her the depths of our love for her. We were forbidden, for the majority of these years, from interacting with her. My niece will be 14 years old in July. I often wonder how things would have been different if her mother had been here all of these years. I know I would have had a closer relationship with her as my sister would have made sure that all of us saw her more and got to spend quality time with her. I often wonder what we could have done differently to have prevented my sister’s suicide. For a long time, we carried so much guilt and shame for not knowing … not seeing … not stopping … this heart breaking, tragic event that took my sister from us all. Oh yes, I often wonder what life would have been like. I sure do. There are times when we can all use that reminder. When you feel battered and bruised, tossed to and fro in the raging storms of life, doesn’t this provide great comfort in knowing that you can draw upon the strength of the Lord? You don’t have to fight this battle alone. Whatever it is you’re going through, it matters. It all matters. YOU matter. And it is important to wade through each and every emotion that comes flooding in. Just don’t get stuck there. Don’t let it bog you down to where you feel like you’re in quick sand. Reach up and grab the hand of the Lord. Allow Him to fill you with all the strength that you need to get you through whatever it is you are facing. No, God will not give us more than we can bear. There are times we may feel like it, and I’m sure there have been times you’ve said that God sure does trust me to give me all of this to handle. Friend, all you have to do is call upon the name of the Lord. Call upon the name of Jesus, and feel your weak, frail body start to feel whole again full of strength and courage even to face what lies ahead. Say it out loud if you have to in order to draw strength and to feel the comfort of His Great and Mighty Arms around you. Say it loud and proud, with authority and conviction, with great determination! My strength comes from the Lord! While it will not make the storms of life immediately grow calm, God will calm YOU, His child. Rest in His presence and allow Him to fill your cup until it runneth over, sweet child of God! Yes, indeed. Your strength comes from the Lord. Allow those comforting words to embrace your entire being: body, mind, and soul. Feel the strength rushing in now as God provides all that you need. I know it has been asked before, but if you had just one wish … what would you wish for in life? That is a tough one. Just ONE wish? Would you wish for riches in the form of money or material possessions? I would hope not. Instead, I would hope that you’d dig deeper into your soul for something that truly matters more. What about the people that are suffering in this life? The ones that hide their true feelings behind their plastered on or fake smile. The ones that laugh the loudest although their hearts are broken completely. Wouldn’t that one wish be better suited going for something like this to heal their hurting hearts? I’m sure they struggle on a day to day basis. They distance themselves, isolate themselves even, in an attempt to hide from this cruel world. So much pain has been inflicted upon them, and they hurt deep to their very core. The things that have happened to them make them question why they had to endure such abuse, heartache, and pain … why does bad things seem to always happen to good people and the bad ones get off free as they appear to skip merrily along in life? It doesn’t make sense at all. Yet, there are so many good people suffering in the world today at the hands of dark, evil people that have used and abused them. Some have had the unspeakable done to them, and yet they force a smile and try to figure out how to heal and move forward. Wouldn’t your wish be better spent on protection over the helpless, innocent little children that are mistreated, bullied, and abused that turn into shattered adults attempting to pick up the broken pieces of their hearts from their childhood days? Would you wish for world peace so that there would never be any more wars taking place? World peace. That would certainly be refreshing. No need for guns, weapons of mass destruction, or the military to leave their families behind to go fight for our freedom any longer because the world would be living in peace and harmony. While we cannot change this dark world all by ourselves, we can make a difference in the lives of the ones that we share our world with. We can be the change that we want to see in the world. It can start with us. It has to! We can take our wishes and apply them to our family and friends. We can extend this grace to our coworkers and any one else that we encounter during the day. We can lend a helping hand or give a pat on the back so that the person that might think inside that they are worthless and that no one cares will truly know that this negative self talk just is not true. If someone is questioning their worth and value, one act of kindness can begin to turn things around for them. You could be the person that makes this very real difference in their lives. Let’s all re-evaluate our lives and actions to see what areas we can improve upon so that we can extend more grace, love, and compassion. We can work together right where we live to make a difference. What a wonderful world it would be if we all came together in one accord to share love – our love and God’s love! Karen’s prompt word of “Wish” got me to thinking and resulted in the above post. Join us for Tuesday At Ten! Have you ever met someone and instantly you felt a connection with them? Not just any ole connection, though. A connection of the heart. That is what I am talking about. Like souls drifting through the ages that have found each other once again. That kind of connection. Oh, it is a beautiful thing when this happens. I have felt this a few times in my life. From meeting the love of my life in high school but not yet realizing that he was “The One” until we reconnected several years later. Then, it was cemented in my heart, mind, and soul. I knew … without a shadow of a doubt … that I would spend the rest of my life with him. He would be my happily ever after. It happened again with my horse. As strange as it may sound, I felt a special connection to her when I first saw her. We contacted the owner who had this beautiful paint horse for sale. Eagerly, we drove two hours to her stables to take a look at this mare. As we pulled up to the stables, I could not get out of the vehicle fast enough. I was so excited to see this horse. No, I didn’t want to buy just any ole horse or the first horse we looked at. She had to be extra special before I would make her mine. I went into this with my eyes wide open being as realistic as I possibly could about the situation. Even still, I couldn’t help but be excited by it all. As we approached the stall where she was kept, she looked over her shoulder at me with her eyes reflecting the tenderness in her heart. She allowed me to walk beside her and extend my hand out to pet her plush sorrel and white coat. Yes, she was so beautiful standing there, but it wasn’t her outward beauty that had me sold the moment I laid eyes on her. It was her gentle nature and the tenderness in her eyes reflecting the depth of her willing soul. Just a few minutes of interacting with her, and I knew she and I had a connection. Ah, but we could not go by looks alone. We had to see how she would ride. I hadn’t had any lessons at this point in time, but I knew how to ride a horse from previous experience on vacations. We always made sure to pick a vacation spot that had a horse ranch nearby. I knew this would be different though, as there is a lot involved with horse ownership than what meets the eye. It is indeed different when you’re on vacation with everyone else doing the work for you at the ranch. We placed the saddle on her strong back and lead her into the arena. I put one foot into the stirrup and lifted myself up and over her until I was positioned in the saddle. With my helmet on and the reins in my hands, I was ready to see how this mare rode. We made a few rounds in the arena before I was instructed to “squeeze” her with my legs to make her go into a trot. Having never trotted before, I was nervous feeling as if every butterfly in the world now resided in my tummy. I gritted my teeth, sat firmly in my saddle attempting to use my “seat bones” and squeezed her with my feet on both sides of her rib cage. This mare went immediately into a slow trot around the arena. I felt alive and as if new life had been breathed into me as I experienced my very first trot on this gorgeous, yet gentle, mare. I could contain myself no longer as I smiled as widely as I possibly could as we continued around the arena still in a trot. Joyful laughter escaped my lips as we made another lap around with her taking such good care of me. I didn’t try to lope (Western term) that day (also known as canter in the English world). I knew I would need lessons before I even attempted that, but I was sold. I knew right then and there that I had to have this beautiful girl so I purchased her right there on the spot. Her name most certainly matches her disposition – Sugar – for she is the sweetest horse I have ever encountered. I have had the privilege of owning this gorgeous girl with a long, flowing white and sorrel mane with perfectly positioned white patches on her sorrel sides for over a year now. Although we have come to be the owners of several more horses, Sugar is my baby. She is my pride and joy; the one I feel such a connection to still to this very day. I can’t imagine my life without her and find myself telling her repeatedly how much I love her. Oh, yes, I am so thankful to have found this horse and for the connection we share! This post was inspired by Karen’s Tuesday At Ten. Last year on this day, I had a horrible accident. I was thrown from the back of a horse that bolted on me. Little did I know, but this horse was “green” meaning that it truly was not broke to ride. The person that we got this horse from was not honest with us as I found out when the horse took off with me on the back. I was literally holding on for dear life gripping the horn of the saddle with all of my might trying to remain in the saddle. We have six acres out in the country, and that runaway horse took me the whole entire length of our property. It was only when she turned to go the other direction that my feet slipped out of the stirrups, and I was thrown from the back of this horse. Thankfully this happened before the horse decided to start bucking, causing the saddle to go underneath the horse. I don’t want to even begin to think how much worse it could have been had that happened while I was still on the horse! The result of the accident was a fractured left hip/pelvic area as well as a fractured left hand. The hand, no doubt, was fractured from me slamming it down on the horn of the saddle and the struggle to hold on tight. The fracture to my hip/pelvic area was due to landing hard on the ground when I was thrown off. For me to be here today is truly a blessing. I know that God was with me that day because the accident could have been much, much worse. I thank God that it wasn’t because I have two children that need me, and I thank God that I am blessed to be here with them and for them today. A few months after the accident, I was anxious to get back in the saddle again. I didn’t necessary want to ride at this point, but I wanted to at least sit in the saddle again to overcome my fear. I knew if I didn’t get back in the saddle soon that the fear would take over, and I would never ride again. I did not want that to happen, and I had to conquer that fear so it would not keep me from doing something that I have such a passion for. When the day came that I felt I was ready to try, I chose my faithful horse who was 15 years old at the time. She was an experienced horse and one of the best, well trained horses that we have. She took excellent care of me. I managed to pull myself up into the saddle, and I sat up there so proudly because I was back in the saddle again! 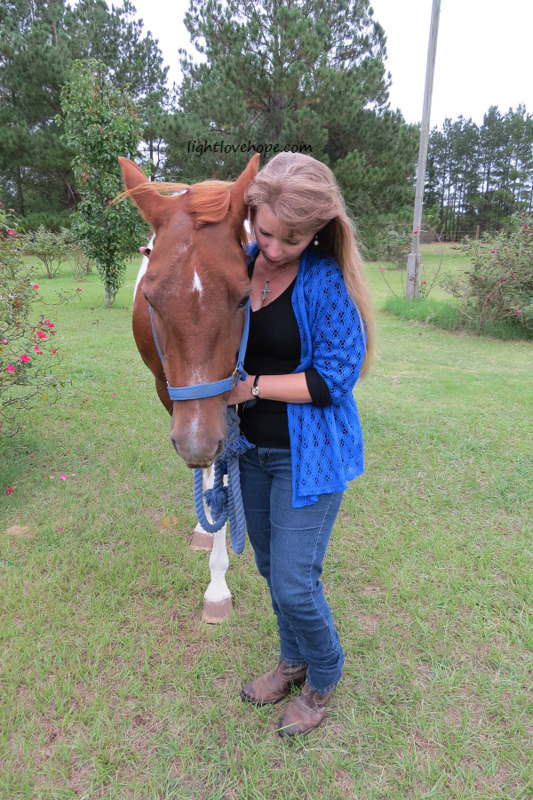 Then, as my horse stood quietly, I leaned down to hug her. She restored my faith in horses once again and allowed me to conquer my fear. Today is a very important day for me. I look back at the accident that never should have happened but did due to a person’s dishonesty. Had this person just been honest with me, we would never have purchased this horse. All this person could see was dollar signs, though, and she did not consider the danger of putting a green horse with our family. Had she just been honest with us … why is it so hard for people to just be HONEST these days?! Yes, she would have lost the sale, but she would have also prevented an accident! This horse was purchased for my two daughters, and I just thank GOD that they were not riding this horse when she decided to bolt. I just thank GOD that if anyone had to go through this, it was me … and NOT my two precious daughters! What ever happened to the horse that bolted on us, you might be asking? We called the lady up that sold us this horse and told her what happened. Initially, she was not that apologetic and wasn’t going to take the horse back or refund us the money. However, she soon decided to do so, and still has the horse to this day. You know how they say that Karma will get you? Well, I’m not a believer in that saying or know whether that is necessarily true or not, but I was told a few months ago that this girl sustained an injury while working with a horse. The extent of her injuries was a broken knee cap! She had surgery and was in a cast where she was pretty much bedridden and unable to do anything at this point due to the cast. I am truly sorry that happened, as I would not wish this on my worst enemy. But, I did wonder if the same horse that did this to me … also did this to her. Our family has been horse lovers for a very long time, and I did not want this accident to change any of that. We have five horses now, and we love them all. They bring us so much joy and happiness. Not all horses are like this. Please know that! I don’t want you to read this post and vow to never get on the back of a horse! We have five – more mature – horses that are just wonderful! They range in ages from 10 to 16 years old. That is a good age for reliable, seasoned horses! They have been around enough to know the ropes, are well trained, and make excellent mounts! 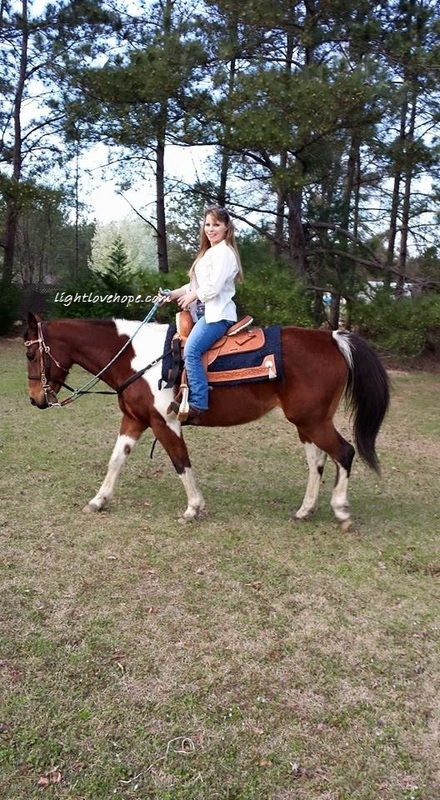 They are perfect for a leisurely trail ride where you can enjoy God and the beautiful world that He has given us! Honestly, I feel a little bit closer to God on the back of a horse. As much as I love God and want to see Him one sweet day, I just thank Him that my time on earth wasn’t up on March 31, 2014! Was it painful last year going through all of this with the accident? YES! But, God helped me through that time in my life, as He has at other times when I have struggled. God is faithful and true! This had the ability to snuff out my desire to ride horses ever again. It had the ability to deprive me of something that, in the past, had given me so much joy. Our family would seek out destinations to go on vacations and make sure that there was a ranch nearby so that we could go horseback riding while on vacation! That is how much we LOVE horses! Then our dreams came true when we became horse owners ourselves! I feel very blessed to have these giant creatures that God has given us. I have a high respect for people that take “green” horses and “break” them so that they will one day be suitable to ride. I have no desire to do that, though, especially after the accident last year. I just thank God that it wasn’t any worse than it was and that my children did not get hurt. There was a lesson to be learned in all of this, though. As much as we would like to believe that people are true and honest … sadly, they aren’t. They will lie, and your life could be endangered due to their dishonesty. That’s the sad, harsh facts! But, an important lesson is to NOT take a single day for granted. Appreciate the life that God has given you and get out there and LIVE it! Overcome your fears! Live your dream! Today, I feel I am an overcomer! With God by my side, He has helped me overcome the injuries I sustained in the accident that never should have happened! 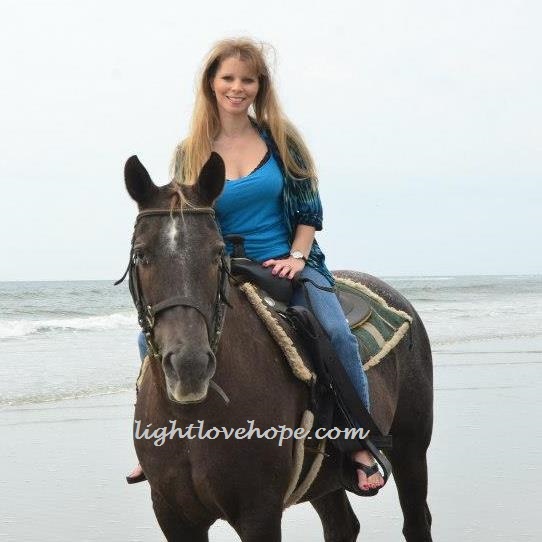 I feel that God has helped me to overcome my fear and allowed me to get back in the saddle again with my seasoned horse that takes good care of me. I am blessed to be able to share this passion for horses with my family. My husband is involved with the care of our horses, and he also enjoys trail riding. My children are involved and enjoy these beautiful horses that we devote so much time caring for and exploring God’s countryside on. Yes, today is a wonderful day, and I know without a shadow of a doubt that I am blessed by God above! While I was thinking of writing a post about this very topic today, it tied in perfectly with the prompt word of Blessed for Karen’s Tuesday At Ten.